The bullmastiff is large-boned and muscular working dog. Its origins as cross between the mastiff and the bulldog are apparent in its appearance. In personality, this breed is smart, alert, and loyal. Though the bullmastiff has a natural protective instinct, the breed is typically quite gentle around children and others who pose no threat. The bullmastiff was developed in England during the mid-1800s. Gamekeepers needed a dog to protect their game from poachers, and they experimented with cross-breeding. At the time, bulldogs were fierce and intrepid—much more than today's bulldog. Yet the breed was too small to take down a human. The mastiff was too large and slow to do the job, but crossing the two breeds resulted in the ideal guard dog. The brindle color was preferred as it provides natural camouflage. This breed was imported to guard the De Beers diamond mines in South Africa. Though the bullmastiff still makes an excellent guard dog, it is better known today as a friendly companion and wonderful family dog. This breed was recognized by the American Kennel Club (AKC) in 1933. The bullmastiff has a short coat that typically needs little more than routine grooming. This breed is a moderately low shedder. Additionally, the bullmastiff's ears and facial skin folds (if present) should be kept clean and dry. This breed is a drooler, so be prepared when he shakes his head. You'll want to carry a slobber rag for this one. By regular walking, your dog should be able to wear down his nails through activity. Be sure to check them and give them a trim if you hear clicking on the floor. It's also good to pay attention to your dog's dental hygiene and brush his teeth a couple of times per week. Like all dogs, proper training and socialization are important for the bullmastiff. Overall, the breed is smart but also has an independent streak. Training will require firm consistency. Curb any habit of jumping on people early as this can lead to hazardous situations once the dog is full-grown. The bullmastiff is not overly active, but the breed needs routine exercise to remain fit and motivated. You should take your dog for a couple of walks each day. You will need good leash training from puppyhood. The bullmastiff will be so large and powerful in adulthood that if he pulls on the leash you will have difficulty controlling him. He probably shouldn't be allowed to run free in a dog park as he is unlikely to do well with other dogs. The bullmastiff is vulnerable to overheating due to its short snout. Don't overdo exercise, and be sure to keep your dog cool in hot weather. 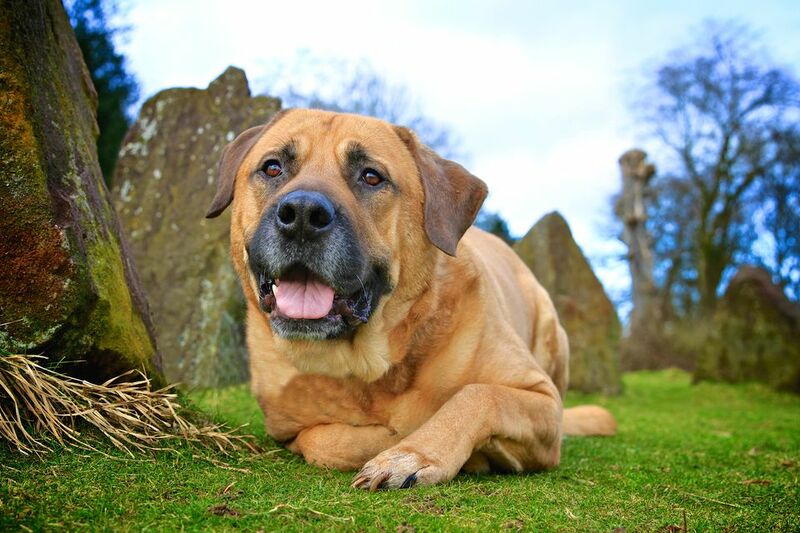 Bullmastiffs are very gentle companions and family protectors that make lovely family pets. They will get along wonderfully with children when properly trained and socialized. As a large dog, they have the potential of knocking down small children or reacting to any mistreatment by a small child. You should supervise your dog whenever he is with small children, and consider waiting until your children are older before adding a bulmastiff to your household. This breed is not a good match for multi-pet households. They have a high prey drive and may harass cats and other small pets, even if they are raised together. Similarly, they don't do well with other dogs. In particular, male bulmastiffs do not live peaceably with other male dogs of any breed. They will confront any animal entering their territory. Adult bullmastiffs are mellow enough for apartment living, as long as you are able to take them out for a couple of walks. They like to live indoors with their people, but they do tolerate a household where their people are gone during the workday as long as they are given attention before and after the absence. But if left alone in a yard, without access to family life, a bullmastiff can develop some destructive behaviors. Above all, the bullmastiff is a loyal and affectionate house pet that forms a close bond with its humans. A bullmastiff should be fed twice a day, with each meal being between 1 1/2 cups and 2 cups of dry dog food, depending on your pet's size and activity level. Always ensure your dog has access to fresh, clean water. Your dog's needs will change throughout its lifespan and you should discuss this with your veterinarian to develop the right feeding schedule, amount, type of food, and exercise. Feeding in two meals can help prevent the problem of bloating and stomach torsion (gastric dilatation-volvulus). When a dog gulps down his food or eats a large meal, it can lead to excessive gas production. In this breed, the stomach may then twist and cut off the blood supply. This becomes a medical emergency. Be sure you monitor your dog's weight and take action if you note he is putting on the pounds. Obesity can shorten your dog's lifespan and predispose him to more health conditions. Discuss this with your veterinarian. Before you decide whether a bullmastiff is the right dog or you, be sure to do plenty of research. Talk to other bullmastiff owners, reputable breeders, and rescue groups to learn more.